After a full week at work, we were either going to brunch, only to regret it the rest of the weekend, or just staying at home binge watching the latest Netflix shows and awaiting the dreaded Saturday evening fear of Sunday morning work. Then we came across Privilee on Instagram and found out about their membership and thought - this is what we need to get our ar*es out the house on a weekend! A membership with Privilee will get you access to the best hotel pools and best beach clubs in the UAE, but not only that, you can also access the hotels’ gyms, spas, tennis courts, and have discounts to fine dining restaurants and even bring your friends at a reduced price - all this for just a fixed fee per month, no day rate or extras to pay! Barasti and Zero Gravity can get old preeeetty quickly, especially on a Friday when they are packed with Dubai newbies attempting their first brunch - a total mess. Privilee, however, allows us to feel like we're sneaking in to the swankiest 5-stars on The Palm amidst a nice, quiet crowd and gives us the feeling we have flown far away from the Sand Pit for a weekend getaway - all 10 minutes from our apartment. Definitely a good compromise when you want to enjoy a lovely chilled pool during the summer heat, while saving up for your next trip - who can relate? 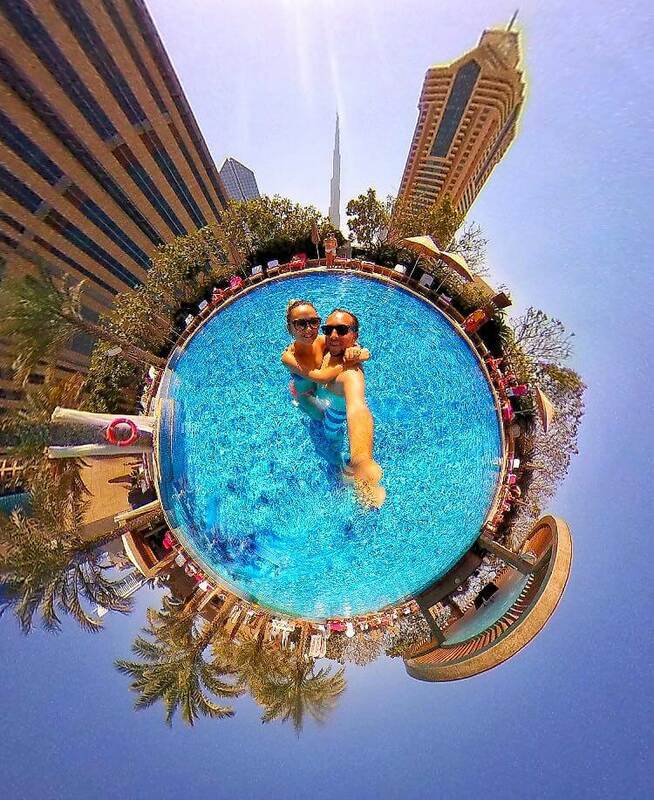 Photo taken using our Insta 360 - best accessory ever! Our favourite combo on a hangover-free Friday is an early gym or tennis sesh followed by a lay-in by the pool, a nice lunch in the sun and finishing it off with a massage at the hotel. It doesn’t happen every weekend, although we wish, but it’s always a nice escape from the work week and a real staycay within our own city. Privilee gets you access to the best hotels around Dubai, such as Rixos the Palm, Fairmont, Sofitel, the W, Waldorf Astoria, but also in Abu Dhabi, with Saadiyat Beach Club or St Regis. So if you’re tired of paying the day rate every weekend and want to feel like a VIP in your own city, Privilee it is! Let us know what you think, and follow us on Facebook & Instagram to see what we’re up to!